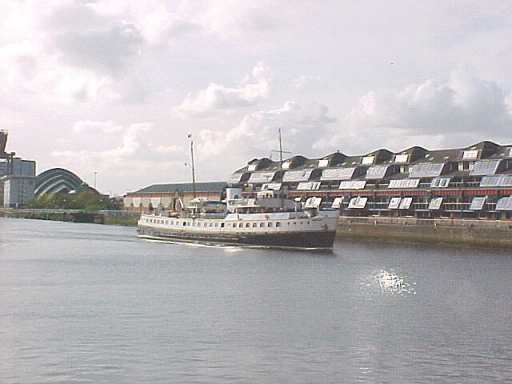 MV Balmoral arrived back at Waverley Terminal, Anderston Quay in Glasgow on 20 April 2000, bringing to an end the longest period of inactivity in the upper harbour in Glasgow in living memory. With Waverley's long absence from her native river during her rebuild at Great Yarmouth, it has been almost 7 months since any 'large' vessel has ventured upstream of Yorkhill Quay - the last was Balmoral at the end of the 1999 Clyde season in September - a far cry from the river's heyday when it was lined with vessels of all types on both sides for several miles from the city centre every day of the year. In 1913 over 16,000 ship movements were recorded on the river. Anderston Quay, Waverley's home in the period 1975-77 and continuously since 1983, was always busy up to the mid 1960s at it was the base of the famous coastal shipping company Burns & Laird Line, with their many fine passenger steamers plying a multitude of routes from Glasgow to Liverpool and all parts of Ireland. 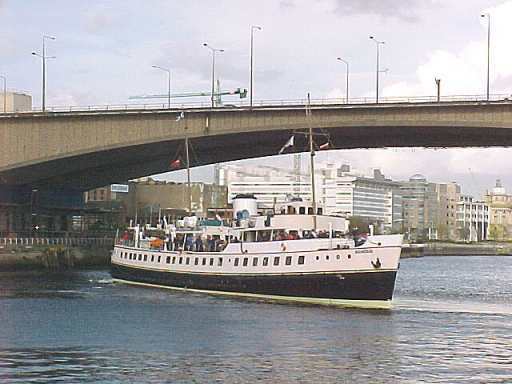 As late as the 1960s it was common to stand on Glasgow's King George V Bridge and look down river to a line of handsome passenger motor vessels including the 'Scottish Coast', 'Irish Coast' and the much loved sisterships 'Royal Scotsman' and 'Royal Ulsterman,' which were engaged on the Belfast service from a berth just in front of the current Waverley office. The berth normally occupied by Waverley and Balmoral would probably have been occupied by the Dublin 'steamer' 40 years ago. For many years the banks of the Clyde between Glasgow and Erskine have deteriorated as the shipyards and docks closed. Save for a few isolated developments, nothing much happened in 30 years. All that is changing now and passengers on Balmoral's first Clyde sailings of 2000 will notice big changes occurring on the riverbanks - even since the vessel's last visit 7 months ago. I shall show 'a Balmoral view' of some of the changes over the course of her Easter sailings. First though, a couple of views of the veteran motorship arriving back at Glasgow Anderston Quay at the end of her first sailing on Friday 21st April. Balmoral arriving back at Glasgow from the first cruise 'doon the watter' to Rothesay of the new millennium. The vessel canting of Anderston Quay between daytime and evening sailings. 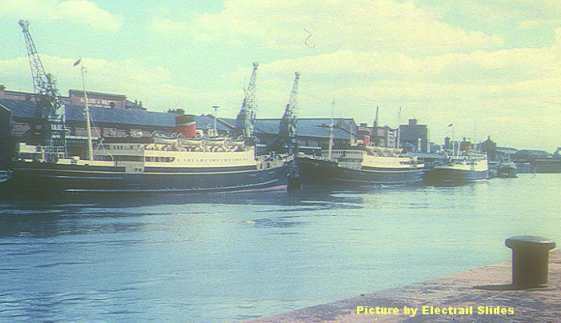 A commercial picture supplied by Electrail showing Anderston Quay busy with Burns & Laird ships Royal Ulsterman and Royal Scotman at Glasgow Anderston Quay on 16th July 1960.